Many of the civil society institutions and great personalities have focused on the entrance of our university in Guinness World Records Book , after it managed ,thanks to Almighty God, with the capacity of its instructors and students to establish the largest board of peace in the world at all. Son of the University, Mohammed Shiyaa’ Al-Sudani Minister of Labour and Social Affairs, who has described the event as historic because it expressed the aspirations of the people as well as Member of Parliament Dr Hanan Al –Fatlawi has attended and participated in this scientific demonstration and has presented her thanks and blessings to the chairman of the project Prof. Abdulbassit Salman , the astronaut Fareed Lafta, the Executive Director of the project engineer Bassim Hameed Jrimid . Iraqi channel has sent a live television broadcast system to broadcast the event through its screens to cover this important and great event , Baghdad University’s website and social networking sites has been crowded with many telegrams and letters, comments and congratulations to the University. Dr. Alaa’ Abdulhussain , president of Baghdad University has mentioned at the opening ceremony , “ we feel today happy with this scientific demonstration and this special event of the Mother University with historical and cultural depth and which has since its foundation has graduated different generations who occupy their positions inside and outside Iraq . As well as being the only Iraqi University which entered the rating of (QS) and got an advanced rank in webometrics ” and recently has got an advanced new global ranking in the publication of researches, and is one of the 25 Arab universities, besides it has been selected to be the first in the “ day of science” annual occasion which witnesses the assessment of Iraqi universities , the formations and their faculty members ”. President of the University of Baghdad has paid tribute to the great efforts made by university professors and students, especially the astronaut Farid Abdul-Zahra and Prof. Dr. Abdulbassit Salman, the project manager and instructor Bassim Hameed , the Executive Director, and also has thanked all those who contributed to the completion of peace symbol board , which entered the Guinness Book, as well as he has thanked the Ministry of Labour and Social Affairs and Mr. Mohammed Shiya’ Al-Sudani , where his ministry played a significant role in supporting the celebration through which the toys of peace board have been distributed to the orphan and displaced children , which represent a moral support and a message of peace to the world. Minister of Labour and Social Affairs has referred to this achievement which carries several messages, because it represents a parental humanitarian and educational gesture from the oldest university in Iraq, towards the orphans who have increased because of the terrorist attacks and earlier wars which led to the fall of many innocent victims and leaving a negative impact on their orphans. The Project manager , Prof. Dr. Abdulbassit Salman who envisions and plans with the university president , has explained that major efforts stood with this national project to raise the name of Iraq in the globe, adding that this achievement will be a new move of the university . Dr Abdulbassit has said that the activity is entitled ” the greatest peace symbol in the world” and this symbol represents a component consists of children’s toys, where the university records a new standard record that had previously recorded by America with an area of 61 square meters, whereas Baghdad University occupies a new record with an area of 103 square meters and the number of children toys up to (2880) , as university students made a major peace board to represent a symbol of peace in the closed Stadium of college of Physical Education at Baghdad University. The scientific demonstration has included artistic activities and has been attended by many official and academic personalities of the members of parliament and the governance of Baghdad , deans, professors, students , such as providing a patriotic applaud cheer that is performed by Choir of College of Fine Arts, TV film on the stages of completion of board of peace, and poetry readings performed by the orphans led by the talented creative child Yaqeen Kareem and distributing the certificates to the shareholders at the completion of the largest board of peace in the world.Our university website and the Office of university channel have accompanied this scientific demonstration and documented it with many images and film scenes. Due to the fact that the health situation is considered the basis for the growth of communities, the university continues contacting with the latest findings of a global developments in this area through the hosting of the world’s top medical institutions and senior scientists and professors from the advanced universities in the world as well as through delegating a large number of professors to scientific workshops , conferences and scientific demonstrations. With these trends, the university has contained many of the developments and improvements to provide the technologies and advanced equipments, especially in the field of medical groups where it has provided the plastinian bodies as well as smart boards ,a large amount of communication networks with the major international universities by “sharing ” and “TV conference” with providing the best references and scientific sources Dr. Alaa Abdulhussain, President of Baghdad University has met a group of professors from the college of Medicine / University of Baghdad and the planning committee supervising the application of new scientific curricula to discuss many topics related to the realized achievements and some of the difficulties that the education encounters as well as he has a look at many of the data brought by the scientific team which represents many of the developments and improvements brought by the college in the past period.He also discussed the important topics in the field of training and holding workshops inside and outside Iraq for upgrading the medical education. The mechanism of participating in international conferences in medical education and the preparation of laboratory skills with high standard mechanisms for training students before practicing on patients have been also discussed, then the professors expressed their cooperation and their seriousness in adopting many of the ideas that have been discussed. The Assistant Professor Dr. Hilal Bahjat Al-Saffar , Director of medical Education unit / college of Medicine / university of Baghdad, to our website in an interview that the presidency of the university has shown cooperation and seriousness in the development and modernization of curricula and scientific laboratories and there is an understanding and great response, especially from Mr. President about the nature of our work, which as everyone knows its sensitivity and nature to deal with a human life. Because of the old curriculum that has not witnessed real changes, and the fact that it is a copy of the curriculum of Edinburgh Medical College in the United Kingdom,which had changed the curriculum for more than ten years. So, it becomes necessary to think seriously to update the curricula of the college of Medicine of Baghdad. This idea was in March 2010, after discussing the subject with Prof. Dr. Muhammad Azri, psychiatricconsultant, at British university of Lester, where it was agreed to submit a request to the British scientific Council (British council) to adopt and fund this idea. In October 2010 , this project was approved in collaboration with the British University of Nottingham. Consequently, two sets of contact have been set between the two universities: college of Medicine of Baghdad university represented by Assistant Professor Dr. Hilal Bahjat al-Saffar, the coordinater; Prof. Dr. Walid Mustafa, the scientific assistant at that time , and Assistant Professor Dr. Batool Ali Ghalib Yassin, the Nottingham University is represented by Prof. Dr. Najat Khalifa, the coordinator and Prof. Dr. Burkett Volm and Dr. Raj Dink, a professor of medical education.Then an Agreement has been signed by the college of Medicine /Baghdad university, Dr. Fadhel Alkhafaji- dean of the college at that time and assistant professor Dr. Hilal Al-Saffar, the coordinator and a member of the British side, Prof. Dr. Hugh Jones and Prof. Dr. Burkett Volm. The website team has accompanied and documented this meeting with a set of photographs. 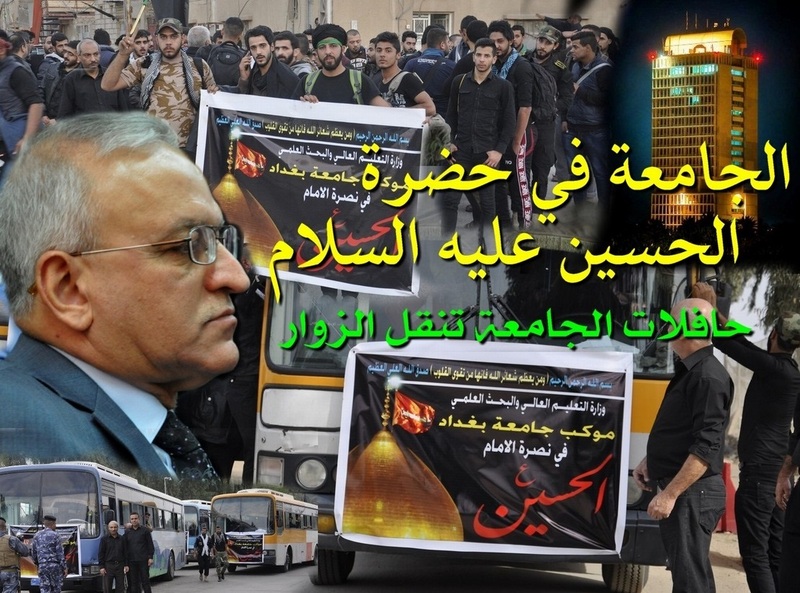 The University has participated actually in the millions visit of Al-Hussein’s shrine in his forty commemoration, where the university has established a procession for a visit and has participated by conducting its cars for the service of the visitors . Dr. Alaa’ Abdul Hussein, the University President has instructed that all university potentials are controlled to serve the visitors of Al-Hussein to magnify the rites of Almighty God, he also confirms during a meeting conducted by the website team that the commemoration of the martyrdom of Imam Hussein is a very eloquent humanitarian lesson , and that the top of Science in the world contemplates what he had done peace be upon him of a creative role of a humanitarian hero after he had sacrificed his life and the lives of his family that accompanied him to martyrdom for the victory of the right against falsehood. The satellite television and the media have focused on this great event, which form a unique situation in the history of humanity, for the attendance of more than 21 million visitors, according to World Encyclopedia of Wikipedia , which reported that the largest human gathering in the history of the earth is in the forty days after the day of Ashura’ of Imam Hussein statistics, in the city of Karbala/ Iraq, which constitutes almost half of the population of Iraq, and also some international agencies reported the revival of this immortal commemoration which constitute one of the most important heritage of the Iraqi civilization and landmarks, where millions of citizens in Iraq and a number of Arab and Islamic countries revive the martyrdom of Imam Hussein, near his holy shrine in Karbala, about 110 km south of Baghdad, with great care of loving and loyal to Imam Hussein( peace be upon him) providing food , drinks and juices and large tents , housing and amenities for visitors until the end of the event for free, and among these are about 800 thousand visitors came from thirty countries , and the 700 hotels of the city were fully booked. College of veterinary medicine at Baghdad University participates in an international conference on the role of science in service of animal health and community. Researchers of the University of Baghdad record sequences of genes in their global researches. University of Baghdad is looking for opening prospects of scientific agricultural cooperation with the delegation of the University Of Florence, Italy. Central library hosts the scientific and academic book fair and the two holy thresholds fair. A study at the university of Baghdad addresses the effect of industrial waste on construction substrates of clay soils. Al-Kindy college of medicine, university of Baghdad holds a workshop on the impact of obesity on treatment of chronic diseases. College of arts discusses global developments in parapsychology. College of agriculture participates in a global conference in Turkey and organizes a number of seminars on soil science. 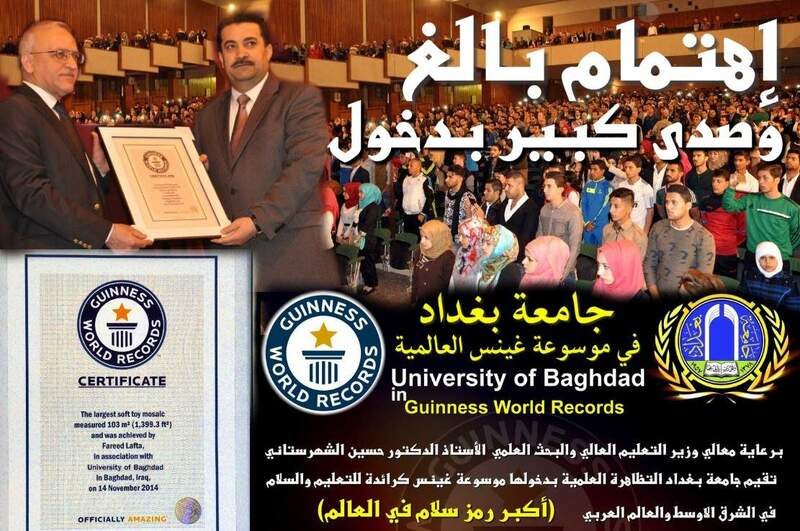 University of Baghdad honors its top students. College of veterinary medicine at the university of Baghdad organizes a festival entitled “Hussein unites us” . University of Baghdad Gets a New Scientific Achievement to be the first in Iraq and Ninetieth in the Arab World in the US.NEWS world Classification. College of Nursing/Baghdad university Participates in a scientific symposium to reduce the phenomenon of persecution and violence against Woman. A Lecture copes with modernity in electrical engineering at the University of Baghdad and the choosing of a faculty member as a scientific rectifier to one of the international journals. Urban planning center at Baghdad university participates in an international conference on environment in Turkey. An instructor at the university of Baghdad publishes two important papers in two world journals by selecting one as one of the latest papers in petroleum engineering. An instructor from our college is among the best fencing referees in the world for 2014 season.